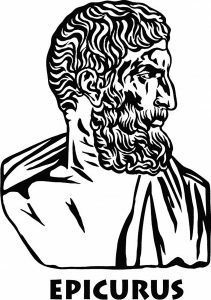 Translation by Brad Inwood and L.P. Gerson from The Epicurus Reader, edited and translated by Brad Inwood and L.P. Gerson. Hackett Publishing Company, Inc., Indianapolis, 1994. Let no one delay the study of philosophy while young nor weary of it when old. For no one is either too young or too old for the health of the soul. He who says either that the time for philosophy has not yet come or that it has passed is like someone who says that the time for happiness has not yet come or that it has passed. Therefore, both young and old must philosophize, the latter so that although old he may stay young in good things owing to gratitude for what has occurred, the former so that although young he too may be like an old man owing to his lack of fear of what is to come. Therefore, one must practice the things which produce happiness, since if that is present we have everything and if it is absent we do everything in order to have it.